Samsung's new flagship lineup of TVs for 2016 are now available in the UK, and they're all UHD Premium certified. The UHD Premium certification is currently the best way of ensuring that your next TV is futureproofed for the next generation of content. Think of it like the older 'Full HD' badge, although it's less about resolution and more about image quality. The certification means that the TV sets conform to a variety of specification, including HDR standards governing maximum and minimum brightnesses as well as offering a 10-bit colour gamut compared to the 8-bit gamut used in the past. 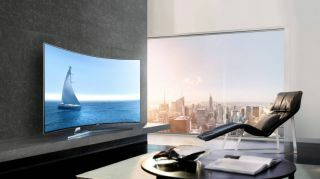 The lineup includes six models, of which one the KS9000 which is the world's first curved TV which comes without a bezel. We liked the set a great deal when we reviewed it earlier this month, but its curved form factor is divisive. In theory the two sides of the screen are equidistant from your eyes, but in practice you have to be sitting so close to your massive TV for this effect to work that it becomes a tad redundant. That's not to say that curved panel technology is completely useless. It works well for ultra-wide monitors for desk use, which tend to be used by a single person sitting much closer than they would to a TV. Disappointingly, the lineup doesn't feature any OLED sets. Samsung has eschewed the technology, and is instead focused on quantum dot, which is much easier to manufacture. This technology involves using nano crystals to improve picture quality reproduction. We were impressed with the quantum dot technology when we reviewed the KS9000 ourselves however. The lineup includes the aforementioned six models and is available with prices starting at £1,299.